Mithuna Foods are the Leading Manufactures and Private Packers for Various Fruit Puree's. We do Private Labeling for major Exporters across India. We also provide R&D solutions for people who are entering Fruit juice Industry. With the assistance of our skilled professionals, we are engaged in providing high grade Guava Puree. The offered guava puree is available in different packaging as per the requirement of our valuable customers. 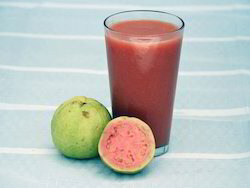 Offered guava puree can be used in confectionery, beverages and many more. This guava puree is processed using the best quality guava & other preservative ingredients in adherence with the international standards. We have been able to carve a niche in the industry, offering a quality array of Orange Puree. The Orange Pulp we offer is widely demanded amongst the clients for their rich taste. Offered products are available in safe packaging. Very Few Produced Pure Orange puree. We are Only Producers of Sulphited Orange Puree and we Do not produce the Original Orange Puree. Need Distributions All Over India With Good Financial Backing To Support Our Frozen Food Items In Your Area. People Who Have Dealt With Frozen Food Earlier Will Have Our Exclusivity . Pack Size: 5, 10 & 20kg/ltrs. White Guava is a tropical fruit, which is in very much like the shape of a pear, and has a yellow-green skin and white, yellow, or red/pink flesh. The guava tree belongs to the myrtle family Myrtaceae. The tree is native to Mexico, as well as Central America, Northern South America and parts of the Carribbean. They are now cultivated throughout the tropics. We have carved a trustworthy and eminent position in the market for offering a wide range of Pineapple Puree. The Pineapple Puree we offer is highly recommended amongst the patrons for their purity. Our Pineapple Puree has longer shelf life and used in juices and various others applications.